This is your access into the City of Denton, Texas data. This open data initiative provides all available public data to business and citizens. Use the search bar at the top of the page to find data relating to topics of interest. As you browse through the different data, the extent of each will be displayed on the map. City Parcels maintained daily by Technology Services GIS Division. This section of the City of Denton website contains many resources which are available to residents of the community. In addition to the many maps which can be found, there is also information pertaining to our current and future Projects, some of the various Technologies we employ, Contact information, as well as Records and Data. Take a look around and feel free to contact us at any time. Find useful information about the departments that make the City of Denton an ideal place to do business, work, live and play. Find useful information from non-city organizations. You may use the search bar at the top of the page to find data. Once you find a dataset you would like to download, select the data and view the available download options. Datasets can also be filtered to display only the features of the dataset that you are interested in for download. Data is offered for download in several formats. Spatial and tabular data formats (CSV, KML, shapefile, and JSON) are available for use in GIS and other applications. Mobile users may require additional software to view downloaded data. To edit a shapefile on an iOS device, users will need to unzip the file with an app such as iZip and then open the file in a viewer/editor such as iGIS. By using data made available through this site, the user agrees to all the conditions stated in the following paragraphs as well as the terms and conditions described under the City of Denton homepage. The data made available has been modified for use from its original source, which is the City of Denton. 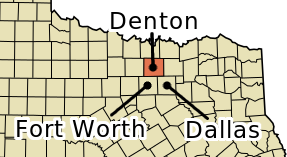 The City of Denton makes no claims as to the completeness, accuracy, timeliness, or content of any data contained in this application; makes no representation of any kind, including, but not limited to, warranty of the accuracy or fitness for a particular use; nor are any such warranties to be implied or inferred with respect to the information or data furnished herein. The data is subject to change as modifications and updates are complete. It is understood that the information contained in the site is being used at one's own risk.